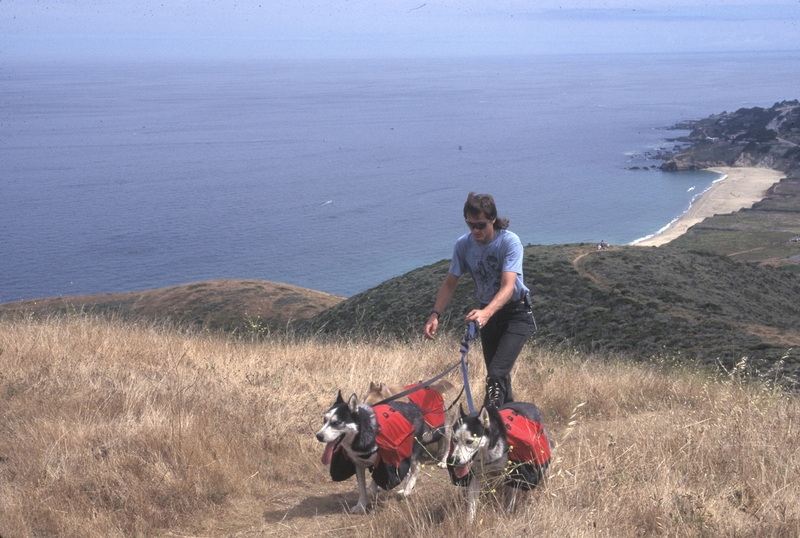 With summer’s clear skies and sunny days, many people enjoy hitting the mountain trails with their backpacks, and a large percentage of those like to have the company of their four-footed companions. This year, instead of carrying your camp gear as well as your dog’s, consider training him to carry a backpack that he can haul his own food, treats, toys and bed in. This can be an enjoyable endeavor that you and your dog can look forward to and do anytime of the year. Begin by training your well-mannered dog to be good trail companion. Get him use to the various terrain that you would normally be covering, other people and animals on the trail, and any logs, rivers, bridges or other obstacles. Remember to consider age and type of dog, coat type, athletic ability, and fitness level, and work your dog within the parameters that are best for him. For example, a thick coated dog will not do as well in the desert country in the middle of summer, whereas a short coated dog will not do as well in snow country, unless he wears a coat or jacket. A dog that has become a couch potato will need to start out in very small increments until he can get back in shape. Small dogs with short legs may not be able to navigate extremely rough country, and long coated dogs attract burrs and foxtails. To start training him to carry a pack, first introduce him to a towel on his back. When he accepts that, let him smell his backpack, then slowly place it on his back and let him wear it around the house and yard. Give him lots of praise! Once he’s comfortable wearing the empty backpack, start by adding something very light to the packs. Boxes of macaroni and cheese do very well, as not only are they light, but they also rattle, which will accustom him to the sound the packs make when brush rubs against the sides of the packs. Use newspaper to fill in the packs and to give the packs more bulk and sway. Then gradually replace this with heavier items. Be aware of how much your dog can carry. The rule of thumb is roughly one-forth of their body weight, with larger, “packing” breeds, such as the Rottweiler, able to carry at least thirty percent or more of their body weight if they are in excellent physical condition. When your dog is accepting the properly weighted packs around the house and backyard, start taking him for walks with the packs on. Begin with short walks, and then gradually add the distance, time, and difficulty. Build up to several short day hikes on flat and easy terrain. Make only gradual changes. Add a little more weight, or hike a steeper trail, or at a higher elevation, or in snow. 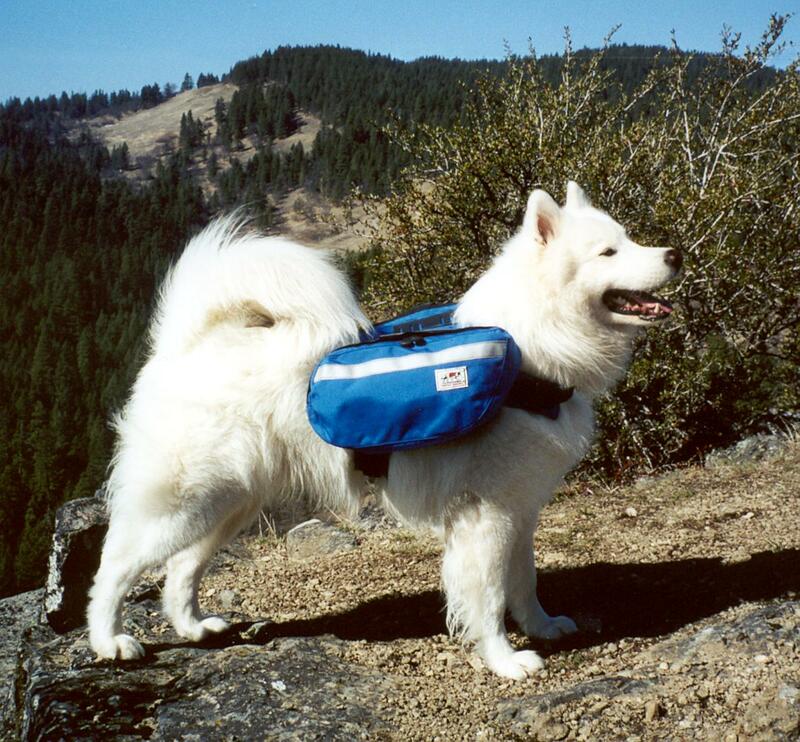 Now you are ready to take your dog on a real backpacking trip. Remember to follow the posted rules wherever you may travel, have more than enough food and water for the trip, take a first aid kit, and have a plan for your trip well thought out and prepared for. Make sure the dog is in good to excellent condition and health, nails are short, and pads have been toughened up by many shorter, fun trails beforehand. For more information on choosing a backpack for your dog, training and conditioning, packing up, mountain biking and geocaching, be sure to pick up your copy of A Guide to Backpacking With Your Dog by Charlene LaBelle! This entry was posted in dog books, dog training, Dogs, Working dogs and tagged backpack training for dogs, backpacking with dogs, Backpacking With Your Dog, dogs, hiking with dogs, training your dog, working dogs. Bookmark the permalink.